At my first craft show, I raided my basement and garage for display stands. What I came up with was pretty random and didn’t really work all that well. Since then, I have steadily upgraded my displays and my sales have improved as a result. At my first show, I found a metal CD rack in my basement and stuck my magnets on and around it. At the show, I noticed people were bending over to see the items and most of them ignored the tray. After all, who wants to sift through dozens of magnets? So I spent hours on the web looking for a magnet rack. I debated between making something or buying something and I finally decided to purchase one. 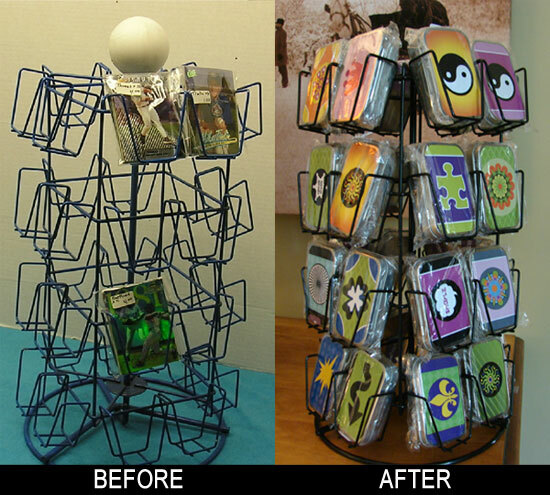 I chose a floor standing, four-sided, revolving metal magnet rack painted black. And I love it. 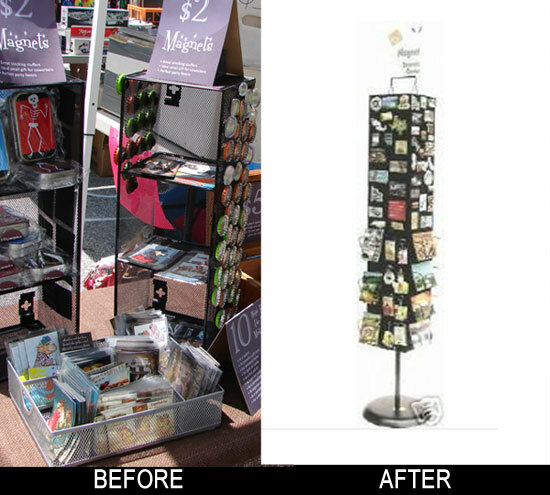 At my second show, using this rack, I sold about four times as many magnets as I did at my first show. Success! You can see here on the left that this rack is really not very good and the bin of magnets at the bottom is not very shopper friendly either. The pic on the right is of the magnet stand that I bought. It is so much better! I position it at the front of my tent so that people walking by won’t be able to help pausing to look at it. You can usually find these on eBay. At my first show, I stuck my notecards in a rectangular wicker basket and set it on the table. Two customers took the time to sift through it. The rest just gave it a glance at walked on by. Since then, I’ve purchased a display rack that I use for notecards and mint tins. This rack is actually for bagged potato chips and other bagged snacks. It has columns of hooks that hold your products. Be aware that you will need bags with holes at the top so you can hang them on the hooks. I bought this on eBay. I have dozens of mint tins with my artwork on the lid that I sell at art shows. I used to dump them in a wicker basket and let people sort through them but I found that most customers are lazy and don’t want to do that much work. So I found this baseball card rack on eBay and bought it for $4. It was painted bright blue which didn’t work with my theme colors at all so I spray painted it a glossy black. My mint tins fit in there perfectly. 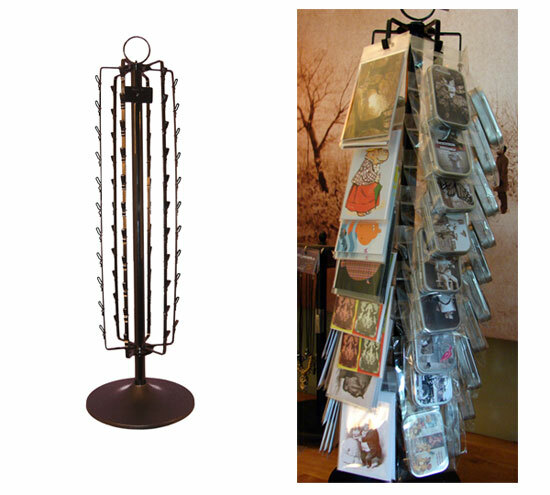 Get your items up and off your tables and into display racks or stands. Make it easy for your customers to stand in the middle of your tent, cast their eye around, and zoom in on something they fancy. Can you please tell me where you purchased the rotating magnet display rack. How much was it and is it available in th U.K. I just cannot find a supplier in the U.K.
You can buy these on eBay from http://myworld.ebay.com/poprackman/. I bought it on eBay from a seller named poprackman who doesn’t seem to be in business anymore.